On 13th of May 2016, Manager’s’ Association of Slovenia hosted the 10th International Gala Ball in Grand Hotel Union, in Ljubljana. Over the years the Gala Ball has become one of the most glamorous evenings attracting around 250 guests, dedicated to dancing, excellent cuisine, networking and charity. 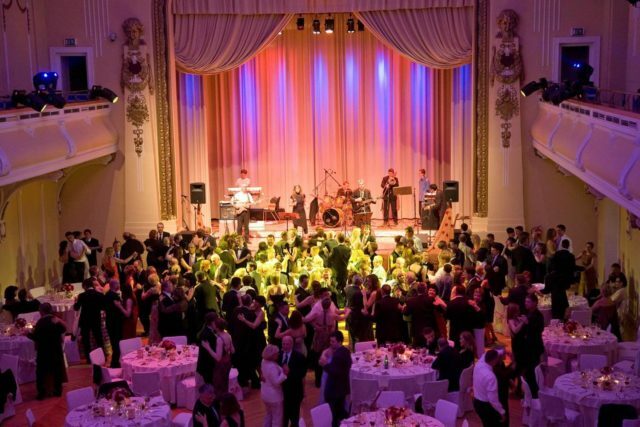 The Gala Ball with charity auction was first organized back in 2006. With the aim of internationalization of the Slovenian Economy the section of Young managers then established the Scholarship fund with a purpose of mobilizing young talented managers all over the world. Since the beginnings, the charity auction of the Gala Ball raised funds for 10 young music artists and 19 students from 15 different countries all over the world. This year the ball and auction were for the first time ever opened to international guests. Next to an outstanding culinary experience guests were able to test their dancing skills on the dance floor of the beautiful Union hall and gave their generous donations to outstanding young, talented post-graduate students and gifted musicians. The evening full of glitz and glamour ended in the good spirit of giving.